VINYLUX is a revolutionary weekly polish system offering durable, high-shine and week-long wear. It contains a self-adhering colour coat and has time-enhanced durability with exposure to natural light. With 62 different colours to choose from, VINYLUX offers something for every style and personality! Chipped nail polish is one of my pet peeves, especially when it comes to darker colours. I’m always on the lookout for long lasting nail colours that dry quickly, but good ones are hard to come by. I had my first VINYLUX nail colour applied by a beautician, and was very surprised by the product. When I paint my nails, I apply a base coat, two coats of colours and a top coat. All-in-all it takes me about 45 minutes. 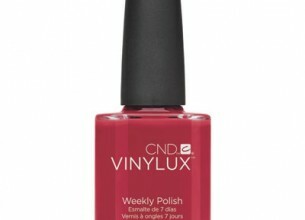 The VINYLUX Weekly Polish has a “self-adhering colour coat,” which means that you don’t need a base coat. The manicure consisted of two thin layers of colour polish, followed by a thin layer of the VINYLUX Weekly Top Coat. What surprised me, is that it really only took eight minutes for my nails to be completely dry after the last coat. I could go ahead with my usual activities without worrying about smudging. In addition to this, the colour was brilliant and shiny, and ultra long lasting. I didn’t experience any chipping or peeling for a whole week. And at only R140 a bottle, it’s a really affordable way to experience a salon-quality mani at home! Being very skeptical at the price and as one needs to buy the nail polish and top coat I tested the product at a Sorbet salon. It really lasts a week and not even gellish lasted a week on my nails. Considering the average cost is around R150 for a visit to a manicurist, this really makes sense. I cant wait to try this product. I love painting my nails but I don’t have the patience to wait for them to dry. I think I could wait 8 minutes though. A nail polish that lasts longer than a day or two is totally awesome. There is nothing worse than going through all the trouble applying nail polish that has to be removed soon after due to chipping and peeling. Definitely going to purchase a few different colours in this range. I have a whole shelf of nail varish, in every colour you can think of. But my nail polish never lasts and literally just peels off… If this product does what it says it does, I will definitely be stocking up.